Categories: Dunsborough, Schoolies 2018 (SOLD OUT). Tags: Busselton Leavers, Dunsborough Leavers, Leavers, Leavers 2018. Groups of 2, 3 and 4 people per room. Larger groups can have multiple rooms side by side. Private Shower and Bathroom facilities for each room. Q) What food places are close to the Sandy Bay Holiday Park? A) About 100 metres from the Sandy Bay Holiday Park there is a Grocery Store, a Fish and Chip Shop, a Deli, a Vietnamese Restaurant, a first-class Bar and Beer Garden and a chemist. Plus daily about lunch time a Coffee Van stops by selling freshly brewed coffee, other hot and cold drinks and milkshakes. Q) How far is the beach from the Sandy Bay Holiday Park? A) The beach is 50 metres away and a many Leavers frequently visit the beach for a swim or just to hang out. Q) What things are there to do near the Sandy Bay Holiday Park? A) About 100 metres from the Sandy Bay Holiday Park there is an awesome bar called Stilts Bar and Grill. Stilts Bar and Grill Restaurant website is www.stilts.com.au. Every day between 12 pm and 1 pm and 5 pm and 6 pm they have happy hour at 50% off! Stilts Bar and Grill has a spectacular Beer Garden. Q) What are the Chalets like at the Sandy Bay Holiday Park? A) They are spectacular! Sandy Bay Holiday Park has Chalets that are like houses with everything for Leavers. Sandy Bay Holiday Park is 20 metres from the beach and has a newly renovated bathroom and shower facilities. There are 3 Barbeque Facilities and 7 Bar Fridges. Ice is available on site if you want to bring your own esky. There are plenty of shaded grassy areas to chill out. Plus the beach is 20 metres away from where you can relax. It’s by far the best Leavers venue in the entire region. Q) What is camping like at the Sandy Bay Holiday Park? A) It’s spectacular! Sandy Bay Holiday Park offers the best camping venue for Leavers in the entire region. Sandy Bay Holiday Park is 20 metres from the beach and has a newly renovated bathroom and shower facilities. There is a brand new and very large camp kitchen with a microwave, a toaster and a kettle. There are 3 Barbeque Facilities and 7 Bar Fridges. Ice is available on site if you want to bring your own esky. There are plenty of shaded grassy areas to chill out. Plus the beach is 20 metres away from where you can relax. It’s by far the best Leavers venue in the entire region. Q) Is it safe to get from the Sandy Bay Holiday Park to the zone? A) Yes, it is. We have onsite security and the buses running to the zone stop 100 metres from the Sandy Bay Holiday Park, opposite Broadwater Shopping Centre. There is adequate lighting at night as well. A) The bus schedule is usually from 6 pm (running every 10 minutes) going from the zone bus stop at Broadwater Shopping Centre (100m from Sandy Bay Holiday Park) to the zone. Returning from the zone to Broadwater Shopping Centre (100m from Sandy Bay Holiday Park) the buses run every 10 minutes until 1 am in the morning. A) As there are so many activities and parties in the zone. We only have a meet and greet with all the Leavers on the first day and this includes a sausage sizzle. This way all the Leavers at the Sandy Bay Holiday Park become acquainted with one another. A) The usual cost is $120 to $130 per person. The final price is determined upon the ticket release on a given year. This cost includes the transport to and from Sandy Bay Holiday Park. Q) Is it easy to get to and from the parties in the zone from Sandy Bay Holiday Park? A) Yes, it is. The bus schedule is usually from 7 pm (running every 10 minutes) going from Broadwater Shopping Centre (100m from Sandy Bay Holiday Park) to the zone. Returning from the zone to Broadwater Shopping Centre (100m from Sandy Bay Holiday Park) the buses run every 10 minutes until 1 am in the morning. 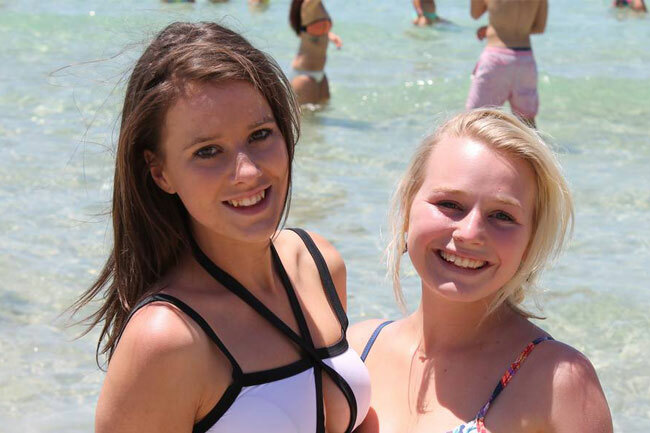 Q) How many people go to the Busselton area for Leavers? A) The Official Leavers activities will be held in the area as usual. There is also great Leavers vibe at the Leavers accommodation that can be enjoyed every evening for all Leavers regardless of age. Staying at the Leavers accommodation is a huge advantage for those who are under 18 as it gives them an extra venue to enjoy and celebrate their Leavers trip. The location is also perfect for them, right on the beach. This is part of the reason it’s rated as the Number 1 Leavers venue. Q) What’s the food like in Busselton? A) Enjoy the amazing food available in Busselton. The food includes all the normal stuff you would expect such as Pizza, Chicken, Steak, Pasta, Fish and Chips, Wedges, Seafood, Burgers, Fresh Fruit. There are also supermarkets (IGA 100m from Sandy Bay Holiday Park), cafes and restaurants close by. There is a full kitchen at the Leavers accommodation if you feel like preparing your own food. Q) Is Busselton suitable for people with dietary requirements such as vegan or vegetarian? Q) What Time Zone is Busselton in? Q) Are there ATM machines close by? A) Yes, there are ATMs available within walking distance. Q) We’ve heard that Leavers at Sandy Bay Holiday Park is awesome, is it? A) Yes, Sandy Bay Holiday Park is premium Leavers accommodation. This is mainly due to the perfect location (right on the beach) as well as the Leavers vibe and exclusivity. 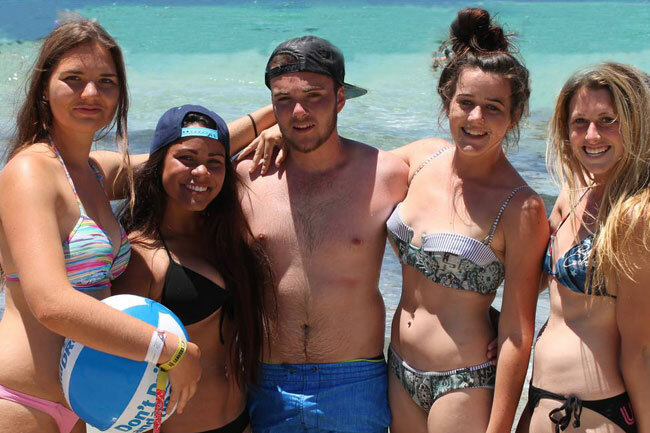 Busselton Leavers was 10/10. Our accommodation, the check in and organisation process was so easy and we had no problems! I will definitely recommend Sure Thing and Sandy Bay Holiday Park to future leavers!